The ecological impacts of a whale fall are far-reaching. According to the National Oceanic and Atmospheric Administration (NOAA), whale carcasses provide a “sudden, concentrated food source and a bonanza for organisms in the deep sea.” Scavengers arrive on the scene first, consuming the soft tissue over the course of a few months, and the remaining detritus can enrich the ocean floor sediment for more than a year, NOAA said. The whale skeleton itself is also a rich supplier of resources — particularly for a type of parasitic creature often referred to as zombie worms (Osedax roseus) because they feast on the dead. “They burrow down into the bone and digest the lipids,” a Nautlius researcher said in the video. According to the Smithsonian National Museum of Natural History, the species was discovered feasting on a rotting gray whale carcass in 2002. In what could be considered an evolutionary hack to avoid searching for a mate, only female worms perform the necessarydrilling to get to the fat within the bones. “The males live inside the females — sometimes 100 males to one female,” Nautilus researchers said. 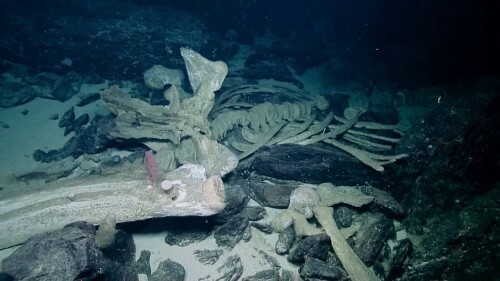 Skeletons from whale falls also serve as a hard substrate for invertebrate colonization. “It almost looks like a type of anemone,” the Nautlius researchers said, while observing a mysterious white orb on the whale’s jawbone. Upon further inspection, though, the scientists said the orb was likely a coral making use of the surface. Based on the shape of the whale jaw, the researchers speculated it was a baleen species, and could have been a juvenile, based on its relatively small size. The new footage offers insights into the fate of a peculiar object that was spotted recently by an Australian fisherman. The strange, floating object turned out to be a bloated whale carcass, which scientists say will eventually result in a whale fall after it deflates and sinks to the seafloor. The Exploration Vessel Nautilus, a 210-foot-long (64 meters) research vessel operated by the Ocean Exploration Trust, is investigating the Southern California continental margin from July 24 to Aug. 12.